What Do the Afghan Peace Talks in Moscow Mean? The talks in Moscow between the Taliban and Afghan opposition politicians reflect a new world order, in which Russia is recognized as a global superpower. Even though the Afghan government remains on the sidelines, the talks may become an important part of the unpredictable Afghan peace process. 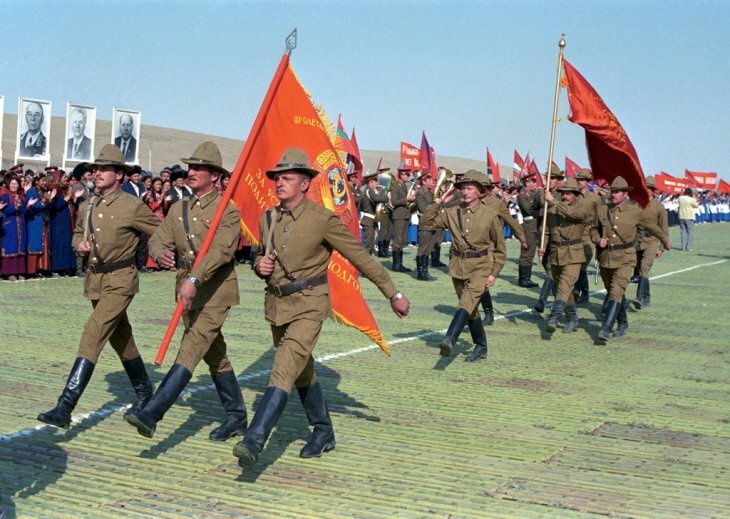 A ceremonial march at the onset of Soviet troops withdrawing from Afghanistan, 1986 (the last troops left on 15 February 1989). Credit: RIA Novosti archive, image #644463 / Yuriy Somov / CC-BY-SA. Via Wikimedia Commons. The images from the Afghan peace conference in Moscow 5-6 February captured the paradox. The delegations from the Taliban and from the political opposition in Kabul included many faces that were prominent in the fight against the Soviet Union in the 1980s. So can Russia forge peace in Afghanistan, nearly 40 years after the fateful Soviet intervention there? Officially, the conference is being hosted by an Afghan-Russian friendship association, but no one is in any doubt that the Russian government is behind the talks. The window of opportunity was created by the US president. He has made it clear that he wants American forces out of Afghanistan. This means that countries in the region, as well as other global powers, will have to take on larger roles. Trump’s special envoy, the Afghan-American Zalmay Khalilzad, reported on 2 February that six days of talks with the Taliban had brought the parties far closer to an agreement. Now a timetable is being prepared for the withdrawal of international forces, along with a formula to ensure that Afghanistan does not become the host for groups attacking other countries. Other topics will have to be the subject of intra-Afghan discussions. And that will be difficult, because so far the Taliban have refused to talk to an Afghan government that they view as a puppet of the Americans. The Afghan president, Ashraf Ghani, has established a delegation to participate in negotiations, but to no avail. What everyone fears most of all is a rapid American withdrawal with a simultaneous lack of any framework for an internal Afghan peace process. The events of the early 1990s live on in the memories of many Afghans. At that time the president abdicated, the government collapsed, and the opposition groups that captured Kabul left the capital in ruins as the result of a bloody civil war. President Putin’s special envoy, Zamir Kabulov, has spent almost his entire career working on Afghanistan. He is well entrenched in both diplomatic and intelligence circles and possesses a unique knowledge of both the country and the surrounding neighbourhood. Only two days passed between the conclusion of the talks between the Taliban and the United States in Doha and the opening of the peace conference in Moscow. Officially, the conference is being hosted by an Afghan-Russian friendship association, but no one is in any doubt that the Russian government is behind the talks. The Afghan delegation is led by former president Hamid Karzai, and includes a number of key politicians who have made clear their opposition to Ghani. These include Haneef Atmar, who recently resigned as national security adviser. Following the recent launch of his election campaign, Atmar has rapidly become a favourite to take over as president. In Moscow, Atmar had an opportunity to put his statesmanship ambitions on full display, and Russia may end up being “kingmaker”. In the presidential palace in Kabul, President Ghani appears ever more isolated. The United States has forced through talks with the Taliban against his will. In these talks, the United States and the Taliban have apparently discussed the possibility of a transitional administration, which would replace the current government and include Taliban representatives. This plan would render superfluous the planned presidential election in July next year. Ghani and his supporters see those who have travelled to Moscow as traitors, and the president has made it clear that the joint declaration from the meeting is not worth the paper it is written on. Afghanistan’s troubled history is not simply a disadvantage for the Russians. They also have a good knowledge of the country and reliable networks, which they have continued to cultivate. Over the past three decades, the Russians have kept a low profile in Afghanistan, and accordingly have also to a large extent remained under the radar of the international media (and to some extent also of diplomats and other observers). President Putin’s special envoy, Zamir Kabulov, has spent almost his entire career working on Afghanistan. He is well entrenched in both diplomatic and intelligence circles and possesses a unique knowledge of both the country and the surrounding neighbourhood. Russia sees Central Asia as part of its sphere of interest, and views politically stable power dynamics in the five ‘stans as critical. In November 2016, Donald Trump was elected president of the United States. In his campaign, he made it crystal clear that he did not want to spend American money and soldiers’ lives on being a world policeman; he was equally clear that he wanted the United States out of Afghanistan. Some days after the election result was announced, Russia issued its first invitation to an Afghan peace conference. Thus it became clear that the Russians wanted to participate in the new “Great Game” about the future of Afghanistan. But what are Russia’s objectives? The most obvious relates to Russia’s concerns about stability in Central Asia. It sees Afghanistan a source of unrest in the region to its north, but does not acknowledge that such effects have been a two-way street. Russia’s view of the situation is heavily influenced by history, not least the fact that during the civil war in Tajikistan in the 1990s, many Tajik rebels sought sanctuary in Afghanistan, where they were given both weapons and training. Russia sees Central Asia as part of its sphere of interest, and views politically stable power dynamics in the five ‘stans as critical. Just as obvious is Russia’s fear of violent, radical Islamist movements. This is partly connected with Central Asia. Several movements from there have taken up residence in Afghanistan, where they have allied themselves with the Taliban, Al Qaeda and (more recently) IS. Many Central Asians travelled to Iraq and Syria to serve as foreign fighters but are now returning home. But Russia is also concerned about Islamism as a threat in a wider sense, both on Russian soil and globally. If the United States secures an agreement with the Taliban on this question, then this is clearly in Russia’s interest. Russia has strengthened its position in the region. With regard to Afghanistan, it has formed a strong alliance with India and Iran. This alliance gives Russia an advantage, given that sanctions prevent the United States from talking directly to the Iranians. Russia has also been stepping up efforts to build links with other countries in the neighbourhood, including Pakistan. And Russia is a key actor in most of the important regional alliances, such as the Shanghai Cooperation Organization, for example. Accordingly, Russia may be in a far better position than the United States to foster regional agreement about Afghanistan’s future. It is easy to find analysts who view Russia’s involvement as having purely evil intent. One view is that the political capital Russia is now building in Afghanistan could be exploited to gain international acceptance of a Russian Crimea. As we have seen in Syria, Russia is seeking recognition as a global superpower, and to a significant extent is being successful. We have to understand Russia’s interest in Afghanistan in this light. Here we could imagine a rivalry with China, which in recent years has been seen as a potential “joker” that could promote stability in Afghanistan. But the Chinese are proceeding carefully. While it is clear that they want to extend their influence in the region, at the same time they are wary of getting drawn into a military engagement and being left responsible for the consequences. Accordingly, it looks as though the Chinese are tacitly accepting Russia’s active involvement in negotiations. Even more interesting is the fact that the United States also seems to be accepting Russia’s role. At the start of January, the Russian foreign minister, Sergey Lavrov, criticized the United States for monopolizing the Afghan peace process. It is easy to find analysts who view Russia’s involvement as having purely evil intent. One view is that the political capital Russia is now building in Afghanistan could be exploited to gain international acceptance of a Russian Crimea. Despite all of this, Russia’s Afghan initiative has not encountered protests from Washington. Russia is recognized as a global player. This is bad news for the Afghan president, who is left sitting on the sidelines. Even so, this may be good for Afghanistan in the longer term. One thing is certain: at negotiating tables where Afghanistan is at stake we are now seeing a new and different world order being played out. This text was first published in Norwegian in Bistandsaktuelt 11 February 2019: Hva betyr de afghanske fredssamtalene i Moskva?